16 April: opposition politician Nikol Pashinyan speaks to a crowd in central Yerevan. Image: Roubina Margossian. Read the latest in our ongoing Unlikely Media series. As part of this series, we profile new independent (and independently-minded) publications from across the post-Soviet space, and interview editors who are trying to make spaces for alternative journalism, political commentary and reporting. These are turbulent times for Armenia. Following constitutional changes in 2015, the country transitioned from a presidential to a parliamentary republic. Some dismissed the move as a tactic by president Serzh Sargsyan to stay in power after his final presidential term expired in April 2018. The naysayers were proven right; two days ago, the ruling Republican Party of Armenia elected Sargsyan as its candidate for prime minister. Today, parliament votes on his appointment. For many younger Armenians, it’s the final straw. Over the weekend, hundreds of opposition protesters marched in the Armenian capital and beyond to “Reject Serzh”. 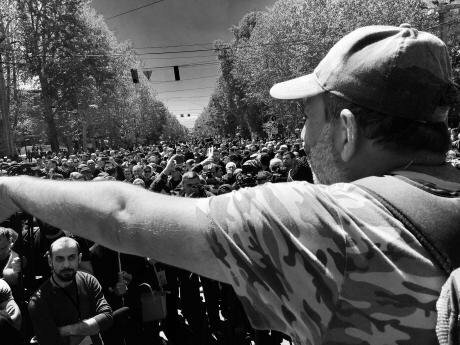 They’ve occupied streets, seized the public radio building, and ground Yerevan to a halt. The new independent media platform EVNReport has been indispensable in bringing perspective to these events. 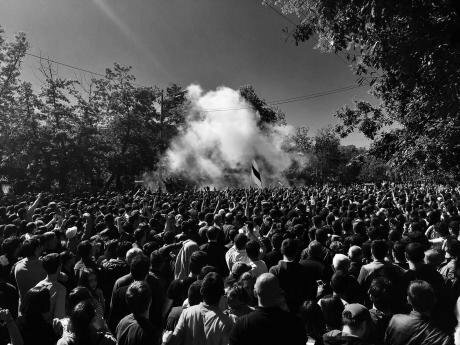 The publication was born in the fallout of an earlier episode of mass unrest in Armenia. In July 2016, a motley assortment of nationalist veterans called Sasna Tsrer (“Daredevils of Sasun”) seized a police station in suburban Yerevan, killing two in the process. As riot police besieged the occupied building, Kajik Grigoryan, a 58-year old unemployed man, set himself alight as protests broke out. Meanwhile, 49-year old Artur Sargsyan approached the fighters and gave them food, for which he was charged with “supporting an armed terrorist group.” After a long stay in prison without adequate medical assistance, the “bread bringer” died in hospital a year later. At the request of EVN’s founder editors, Yerevan-based poet, academic, and musician Arto Vaun penned a short essay, “Bread and Fire”, on Sargsyan’s death. “Either a nation is full of apathy and hypocrites and gets what it deserves, or it isn’t”, wrote Vaun. So appeared EVN Report, which has just celebrated its first anniversary, seeking to tackle old taboos and hit a few new nerves. 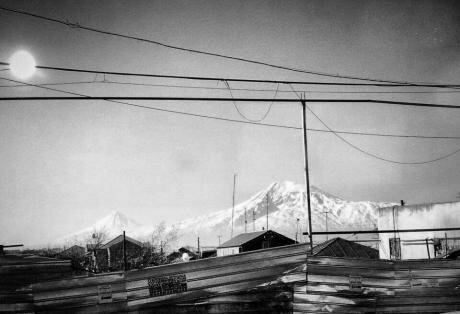 Maxim Edwards speaks to the project’s founding editor Maria Titizian and managing editor Roubina Margossian about the Armenia they aspire to, and the Armenia they have to confront to bring it about. There’s no shortage of English-language Armenian publications, based in both Armenia and the US. Rather than ask you what they’re doing wrong, can you say a few words about what you aim to do differently? Roubina: We’re the only ones in Armenia creating primarily English language content. Almost everyone else who has content in English often translates the text created for the local Armenian reader. On the other hand, there are many primarily English or mainly English-language outlets in the diaspora, but here the difference is just that they are not based in Armenia itself. Maria: When we launched EVN, our mission was to provide compelling analysis and in-depth commentary, something we felt was missing in the Armenian media landscape, especially in English. This was conditioned by two events in 2016 — the April War [with Azerbaijani forces in Nagorno-Karabakh - ed.] and the Sasna Tsrer takeover. Everyone was reporting on it, but no one was asking the really tough questions. On the other hand, national discourse was hijacked by extreme voices on opposite poles of most any issue confronting the country. While we’re very passionate and perhaps even activists-at-heart, we are very careful to understand the nuances of the stories we develop and publish. We try to be even-keeled, looking at all sides of the issues and let the reader decide what they feel or think. Have we always succeeded in doing this? No, because we understand that we too bring our own personal, political, cultural baggage to the conversation. We have always tried to be honest about that, acknowledging that objectivity can be feigned for the sake of objectivity but honesty is what makes a story great. 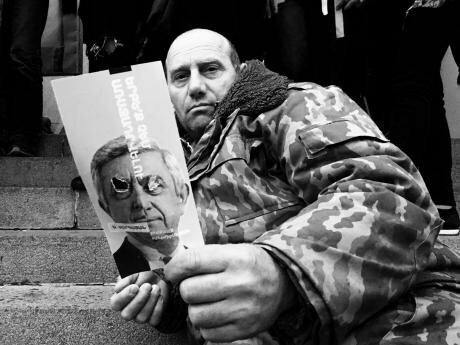 A protester holds a poster of outgoing president (and probable incoming prime minister) Serzh Sargsyan. 15 April, Yerevan. Image (c): Roubina Margossian. We decided on long-form journalism because we believe that readers want insightful pieces and when they’re written well and with great thought, people will read them. The proof is in the pudding — most of our longer, heavier pieces are the most read ones on our website. Yet EVN report isn’t really a “report” at all, but rather a magazine of essays, longform reportage and feature pieces. Can you tell us a little about what you publish, and who your authors are? Roubina: EVN is a magazine. We try to explain background and context, bringing back topics that have dropped out of the day’s news feed or talk about things that never make it into the news. We sometimes publish poetry and fiction and if there is a developing story, we change gears and go into news mode. We’re not a pure breed. Maria: While we publish the usual topics (politics, economy, tech, culture), we also feature compelling commentaries on issues ranging from regional issues to Armenia-Diaspora relations to questions of identity. We feature stories that others aren’t writing about — delving into archives bringing back stories that have been hidden on dusty shelves. We feature women prominently, because we can and should. We look back on recent events and those steeped in history to understand the trajectory of the nation and bring stories that help us understand the complexities of living in a post-Soviet developing country. Our authors aren’t always journalists, many are academics, professionals, experts in their respective fields and some are younger writers, including university students. When do you choose to publish in Armenian, and when in Russian or English? Roubina: Armenian content was not initially part of the plan or vision. The first piece we published in Armenian was “Eclipse”. The Ministry of Culture had shut down an exhibition about Stalin-era repressions in Armenia. It was an installation at the Hovhanes Tumanyan Museum based on archival material. So we asked the curator of the exhibition and the director of the museum if she would consider lending the material to EVN Report where we could sustain an online version of what had been physically removed. That was when it did not make sense or even seem fair to take something that was created for the people in Armenia and only present it in English. So we made the first exception. The sentiment lingered. We were often being asked if this or that piece is available in Armenian; now we can sometimes say, “yes”. We do not have the resources, nor at this point the intention, to be a fully bilingual publication but some pieces and subjects demand to be in Armenian, like our series on the ‘88 Movement [The nationalist movement advocating for Nagorno-Karabakh’s unification with Armenia before the collapse of the USSR - ed.]. Maria: We are primarily an English language platform for a specific reason: We felt that we were stuck in an echo chamber, we were only speaking to ourselves especially in times of crises and mostly in Armenian, and there was a great need to communicate with the world in a language that was universally understood. Protesters have blocked several key roads in central Yerevan, and have begun to block roads into the city in order to disrupt the parliamentary vote. Image (c): Roubina Margossian. We wanted to be a gateway for the world to see and understand Armenia and the issues it confronts and overcomes. We have started to publish select pieces in Armenian and this was conditioned by requests by readers. We will remain a primarily English-language publication and if and when we have the capacity and capability, Armenian and Russian would be considered. It seems you don’t have to dig too deep beneath national(ist) solidarities to find mistrust between diasporan Armenians and hayastancis, ethnic Armenians born in the Republic of Armenia. One sees this dynamic in some attitudes towards the civil society sector — “it’s just another bunch of liberal diasporans coming over here telling us how to run things”, and so on. To address that, you’ve described your approach as one of “constant humility”. Could you expand on that? Roubina: That is exactly what so many of our pieces say, sometimes very directly and sometimes by implication. Neither the diaspora nor the population of Armenia come from the same cookie cutter or were even baked in the same oven. If we just look at EVN Report, you’ll see the Canadian-Armenian journalist with roots in Lebanon, the LA-Armenian lawyer with roots in Tehran and Baghdad, the Gyumri-Armenian historian, the Boston-Armenian poet with roots in Aleppo and Yerevan, the Yerevan-born, Beirut-raised psychologist who is the “diasporan” in Armenia and the “hayastanci” in the diaspora. Collectively, we’ve come out of civil wars, revolutions, the Soviet Union, the 1988 earthquake, territorial conflicts... different forms of democracies, authoritarian and religious settings... The diversity of our collective experiences is pretty striking, and it is even wider if you look at our authors and readers. People either feel a part of civil society or they don’t. That is not something that changes overnight when you change your place of residence. So, “constant humility” is the environment where we all start speaking the same language. One of my favourite articles focused on the place of Russian Armenian identity in the Armenian diaspora, and another was Roubina's very personal farewell to Bourj Hammoud, an Armenian district in Lebanon. Many of your essays seem to be asking “who gets to speak for Armenians?” Like other diaspora communities, the Armenian world does coalesce around certain institutions, leading “community leaders” to become gatekeepers and definers of collective political stances. How can we open the gates? Roubina: For me it is about what we need more of — intelligent, well-researched, well-founded and civil dialogue. And more people who have the guts to stick their fingers into the wound before they can attest to a miracle or foul play. Maria: The Armenia-Diaspora divide is very personal for us. We know that we can never understand the life stories, the narratives, the personal experiences of Hayastancis therefore we never assume to know better than them regarding what their needs, desires or dreams are. That is why “constant humility” is so important. We are not missionaries here to save anyone and whoever comes to Armenia with that notion is does a grave disservice to this country and to themselves. EVN report goes to a lot of uncomfortable places. You’re critical of militarism, and of how the imperative for national unity drowns out alternative opinions. You’ve recently looked at how Armenian-American organisations have buttressed this militarism (as well as Armenia’s less-than-democratic politics) from afar, to the detriment of civil society in Armenia itself. What would you say are the other taboo topics in Armenia’s media, and how can they be broached? Roubina: In my opinion, certain subjects are often not discussed because, on the one hand, there is an environment of unhealthy self-censorship. On the other hand, there is a considerable amount of heavy-handed criticism. But most often it arrives post factum when there is little-to-no room to be constructive. Maria: Probably the most taboo topic in Armenia is the army. Full stop. For a nation that lives in a state of no war, no peace, with the possibility of the conflict [over Nagorno-Karabakh] escalating out of control, it’s understandable that people are careful not to be very critical of the armed forces. But we need to ask ourselves a question: Is it our role as journalists to serve the defence ministry or the people of Armenia and Karabakh? This is a question we need to ask because traditionally the Armenian media has been very careful when it comes to reporting about the army and the truth is that this self-censorship allowed many abuses to fall under the radar of public scrutiny and many of these abuses became apparent after the April War. I think we did a disservice to the people of Armenia and the men serving in the army because of our trepidation and self-censorship. Both your founder editors are women, in a country where both politics and the media grapple with gender-based discrimination and the primacy of “traditional values”. Recent years have seen some small-scale public advocacy for feminism and women’s rights, and you’ve highlighted the remarkable stories of Armenian women throughout history. Women are talked about in Armenia as cherished bearers of family and national tradition — how much of a voice do you think Armenian women have in politics, and what’s EVN Report’s contribution to amplifying it? Roubina: Women come to EVN not because so many of us on the editorial board are women. Women’s issues organically took up a part of our content because they are issues that need to be addressed and dealt with. Domestic violence is violence, and Maro Alazan and Countess Tumanyan were incredible human beings, so we need to be reminded of their courage, resolve and generosity...The largest group of domestic violence victims are women. Alazan and Tumanyan and so many others were forgotten because they were women. I sincerely hope EVN Report will help amplify the message that no one can finish a race if they insist on putting only one shoe on. Maria: I think we have a long way to go before we can say that women actually have a voice in Armenian politics. I don’t want to make any sweeping statements, it’s a very personal decision and yet a serious societal issue — but when half the population does not have a role in decision-making bodies, then we should stop pretending we’re trying to build a democracy. We’re trying to find stories of women, ordinary and extraordinary, who could serve as the missing mentors, icons in our lives — something that has been missing in our lives. And you don’t have to dig too deep, right there below the surface, buried just under the narratives written by men, are reams of stories about women and written by women waiting to be told. That’s what we’re doing, one story at a time. Writing on Armenia for international media is never easy. The country is dominated by either Karabakh or the historical memory of the genocide. In that context, it’s difficult for domestic social issues to get a look-in — yet that’s just what you’re doing, whether by addressing recent protests against the new conscription law, the treatment of the disabled, or the ongoing struggle against domestic violence. Is this a conscious focus of the project? Roubina: Most of these topics seem strictly Armenocentric only on first sight. Take out the names and the geography, and the narrative is universal. Most often it is a matter of approach and language. You have to decide if you want to speak of your grievances and achievements only within your own context or a more international context. 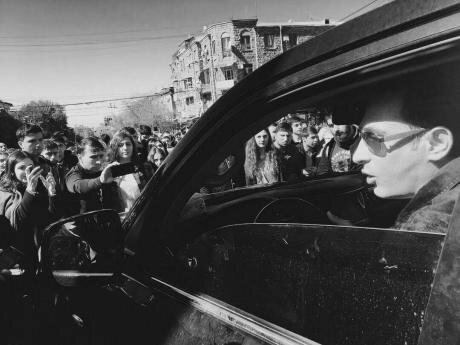 Anger has not abated - one thing which unites many Armenians across age and class is a deepening mistrust towards the country's ruling elite. Image (c): Roubina Margossian. Students in Armenia are fighting for something and students in America are fighting for something, different students and not exactly the same fight, but there are commonalities — the right to an uninterrupted education and the fight against a state policy that creates the conditions for this interruption. What is happening in Armenia and the #metoo campaign are the different manifestations of the same patriarchal mentality. I think it was the Armenian poet Paruyr Sevak who wrote that sometimes, “a wall will remain a wall, but a perfectly good forehead will be lost”. So you say that your project is one of “radical love, radical empathy, and radical honesty”. Which one of these is the most important to each of you, and can it ever be achieved? Maria: All of them, but if I had to choose one it would be radical love. I’ve often thought we don’t really love each other enough because if we did we would have more empathy, we would be more raw and honest and we’re not. At least not enough. Love means listening, respecting, honoring, and lifting each other up unconditionally. It is the beginning and end of everything.